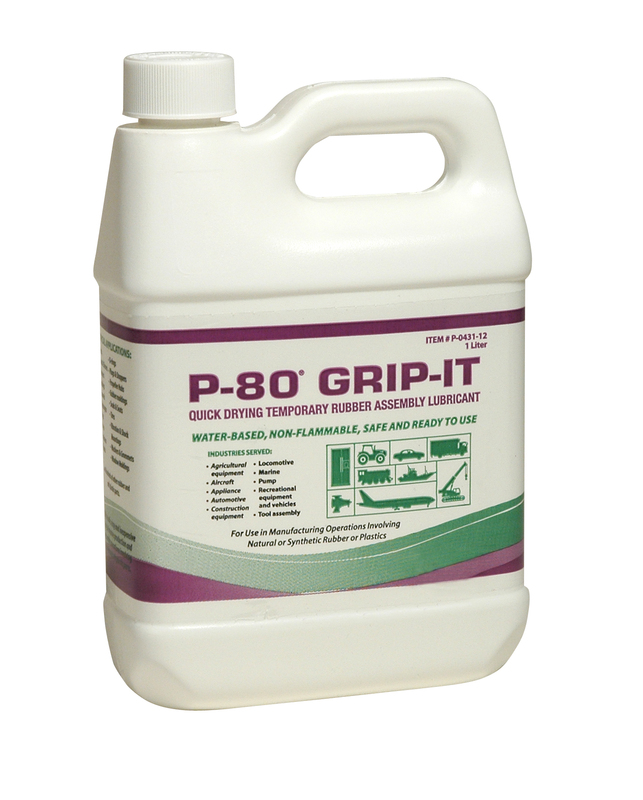 P-80® Grip-it Quick-drying Temporary Assembly Lubricant is a multi-functional product formulated to both lubricate and provide some adhesiveness for the mated parts. P-80 Grip-it wets out easily and completely on the part to allow for easy installation. In as little as 15 minutes, P-80 Grip-it dries leaving a thin tacky film, which helps the parts remain attached. P-80 Grip-it works well on porous and non-porous rubber and most plastics. Because it is quick-drying and dries slightly tacky, P-80 Grip-it is used on parts that are subsequently pressure tested. Uses include easting the assembly of hoses, bushings, seals, o-rings, grommets, grips and other rubber and soft plastic parts. Application techniques include dip, brush, sponge, or spray.